""The figures shown are those readable, partially or not, at the top of the cards - except for the Hanged Man, where the figure is written at the bottom, 'upside down'. These Roman numerals are drawn in ink and appear slightly after the completion of the cards (first half of the 16th century at the latest)"
There seems to be an incompatability between "slightly after the completion of the cards" and "first half of the 16th century at the latest", unless he were saying that the cards themselves may not have been painted until the first half of the 16th century at the latest. I had to check the French to make sure, and the translation is good. But in 1984, he still attributed them "Italie du Nord, fin du XVe s." - end of the 15th century. So he could push the numbering "slightly" if he gave the manufacture to circa 1490, and the writing to any time in the next 50 years. All very vague and unsure, and in his discussion he pushes against the-then Ferrara assumption ("anything not Milan was Ferrara" as he told me used to be the working model) by timidly suggesting Bologna - a move southward, recognizing the A style in it. But he has clearly settled on circa 1460 and Florence now, so if the numbering is "slightly" later, then it is in nowise after 1500. I do not see how settling on c. 1460 changes anything. First, we don't know why he said "first half of the 16th century at the latest." It may have had something to do with the script. Or, most likely in my opinion, he might have had in mind when numbers started being added to the deck, so that people didn't have to remember the order any longer. That happened around the first half of the 16th century. On the other hand, he might have said "first half of the 16th century" to allow what he thought was the maximum lag between one owner and the next. In that case, "first half the 16th century" just explains what he means by "slightly". In 1984 he dated the ChVI to the end of the 15th century (see the link Alain just gave). Then in regard to the numbers, Depaulis wanted to explain, in this context, what he meant by "slightly after", namely "the first half of the 16th century at the latest". In other words, it is as much as 50 or 60 years (assuming that by "end" he meant the last decade. 50-60 years after 1460 is 1510-20. The main point, whatever Depaulis meant, is that there was enough time between the time the cards were painted, whenever it was, and the time that the numbers were added, for the cards to change cities: It is as at least as long a time span now as it was in 1984. So the numbers aren't as important a consideration as the iconography, for identifying the city of origin. But they still carry some weight. A family in one city is likely to sell first to someone in the same city. But the highest bidder might be elsewhere. It is true that they didn't have the Internet then, but wealthy families in one city would know their counterparts in other cities, unless animosity between cities got in the way. In 1984 Depaulis gave "end of the 15th century" - probably meaning the last decade of the century - as the estimated date of creation, with the numbers added "slightly later", but "the first half of the 16th century at the latest." It is not clear whether today, when he dates the cards to c. 1460, he would say "first 10 ir 20 years of the 16th century at the latest" (subtracting 20-30 years from the original statement) or if he would still stick to "first half" and remove the "slightly". In any case it would be enough time for the deck to change hands from one city to another, even if changing hands in the same city is more probable. The hand-written numbers are one consideration but not a decisive one. As far as such a statement appearing in Alain's essay, it belongs in his "Conclusions part B" section rather than where I put it in my post. If Alain wants to add something to that effect, or refer to this post, he is free to do so. But it really isn't necessary even there. I didn't bring in the Catania, since Alain didn't. Yes, the numbers there are consistent with the TdChVI: an Arabic numeral 10 on the Chariot , and an 11 on the Hermit - both of which tend to confirm Depaulis's 2007 reading of the same cards in the ChVI. There is nothing visible on the Temperance or World card (viewtopic.php?t=627). Also consistent with the ChVI, and even more with the other Catania numbers, given that it is an Arabic numeral, is the 2 on the Palermo Empress, (https://4.bp.blogspot.com/-8NWi7gr6-Gc/ ... atania.jpg), which Maggio argues should be considered part of the Catania deck. Stylistically the Catania is also relevant to dating the ChVI, since it is so much like the ChVI. In this regard the same workshops have been proposed for the Catania Temperance card as the two that Alain mentions for the ChVI, Apollonio by Maggio and Scheggia by Huck. I still think that the ChVI is most likely Florentine. In my post, I meant to be trying to correct what seemed to me an over-emphasis on Bologna and Ferrara in Alain's essay as it stands, based on old research made obsolete by Dummett 1993 and Depaulis 2007. By email I am proposing to Alain other corrections to his essay, so as to make it consistent with Depaulis 2007, such as changing "similar to the order of Bologna" to "similar to the orders of Bologna and Florence" earlier in the essay (avoiding having to explain what "order A" is), as well as broadening the similarity in clothing styles from just Bologna and Ferrara to these plus Florence, as several posts on this thread have done. . Thanks for the explanation, Mike. I wasn’t clear on what problems you were addressing in regards to Charles VI. For my part, I’m staying with Thierry’s hypothesis of a transition period in Florence, where the Popess was removed but before Minchiate was invented. The Strambotto also shows the Chariot placed before the Wheel, whereas in Minchiate it is above the Wheel. 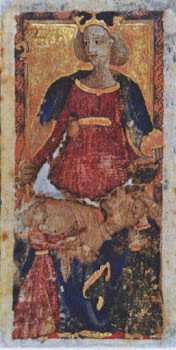 Since the numbering of the Charles VI is like Minchiate, in both the Chariot at X and the TFJ order for the Virtues (Temperance-Fortitude-Justice), with only three “papi” cards (Emperor is iii, Love is v, so the Pope has to be iiii, leaving only one card between Emperor and Bagatto, presumably the Empress, just like in the Strambotto), but because it actually numbers all of the cards, including the highest, the numbering on the Charles VI represents a practice after the Strambotto, but before Minchiate was invented (Minchiate also transforms the Pope into an Emperor or Sultan, removing the last religiously offensive card from the iconography). That is, I tend to agree that Charles VI, and Catania (Empress is 2 as well, as you pointed out), were numbered around 1500. The evidence shows evolution of the ordering of the trumps in Florence. The removal of the Popess (or a second Pope), a slight shuffling of the Virtues (TJF to TFJ), and the elevation of the Chariot from below the Wheel to immediately above it. More thoughts on the Charles VI. It belonged to Roger de Gaignières, who gave it as part of his huge collection to the King in 1711, after which most of it became part of the Royal library, which evolved into the Bibliothèque nationale. De Gaignières' collection of artifacts and depictions of monuments was almost exclusively French (and are the sole source for many pre-Revolutionary statuary and inscriptions), so it was difficult to know where he got the Italian cards in his collection. - and there it says that he visited the Grand Duchy of Tuscany with Philippe-Emmanuel Coulanges, whom they link. There it says that Coulanges went there in 1658, so if De Gaignières went with him, he was only 16 at the time! That's alright, 16 was a respectable age for a young man to be learning his place in society then. So maybe he picked up the cards in 1658. One can imagine a market in Florence selling these old artifacts, especially in fragmentary form, and Roger was to become a major art collector. Remember also that when Martin Lister visited De Gaignières in Paris in 1658, and saw his collection, he called the cards (not yet called Charles VI) a "toy", and that they were 300 years old. He must have heard both the date and the name "toy" (normally this is "jouet" in French, but I don't know if this was always standard or if "jeu" might have been a game as well as a toy back then) from De Gaignières, so this might be further confirmation that he bought them as a very young man. I haven't looked further into Coulanges or Roger de Gaignières' biography to get more detail, but I'll follow it up. Ross about toy : was the word in French jouet or jeu? Ross: so when does Depaulis think minchiate was invented? That would help in knowing how long after the strambotto he would countenance for the numbers being added to the ChVI.
" as in "les années 1980", which means "the 1980s"